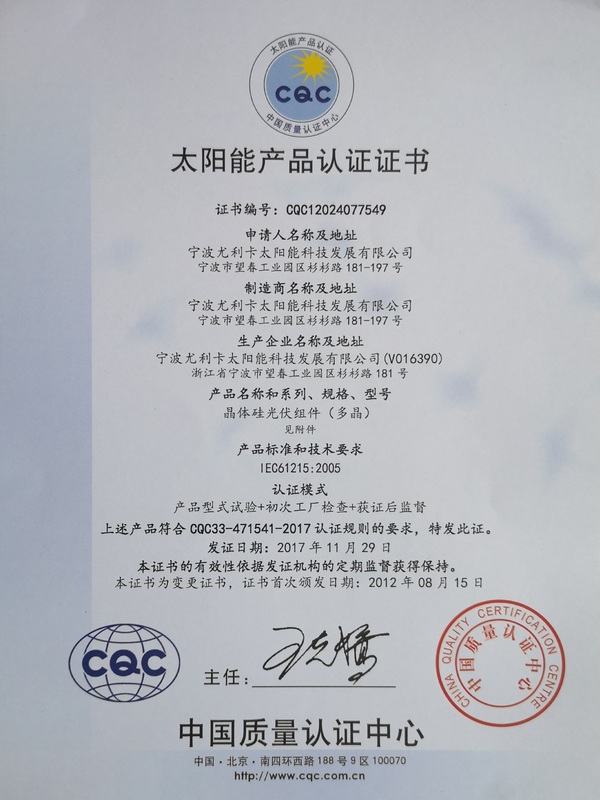 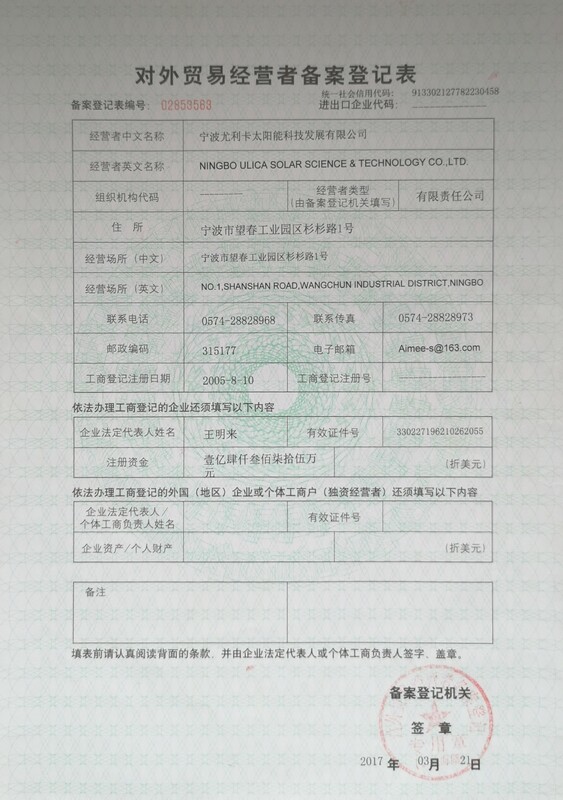 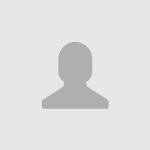 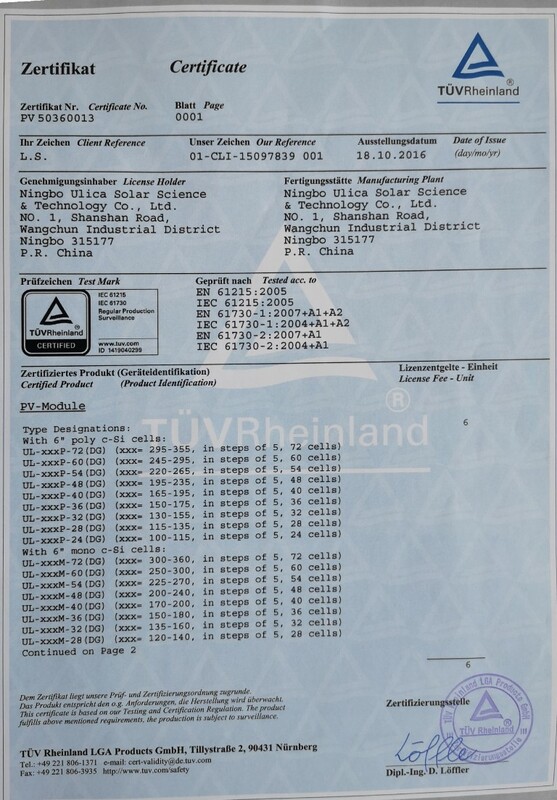 Ningbo Ulica Solar Science & Technology Co., Ltd.
الشركة الأم Shanshan Group Co., Ltd.
يوجد 15 موظفين للتجارة الخارجية بالشركة. 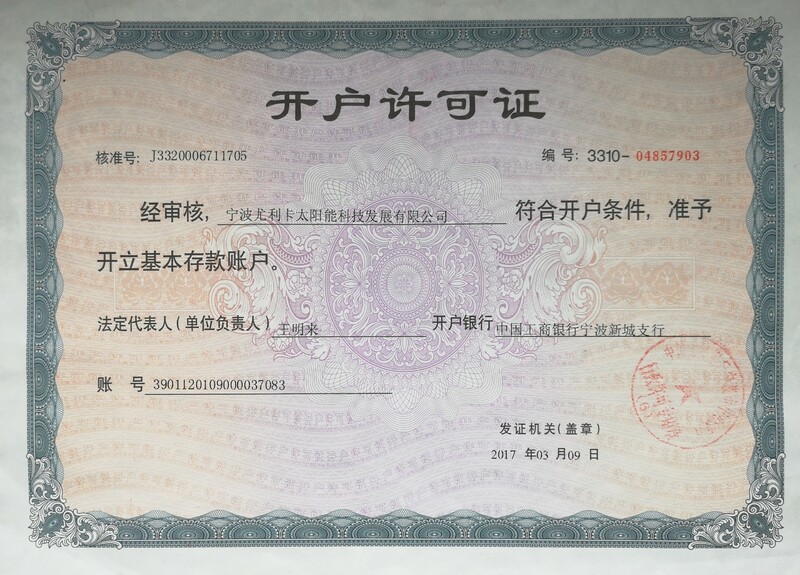 يوجد 3 من مهندسي الأبحاث والتطوير بالشركة. 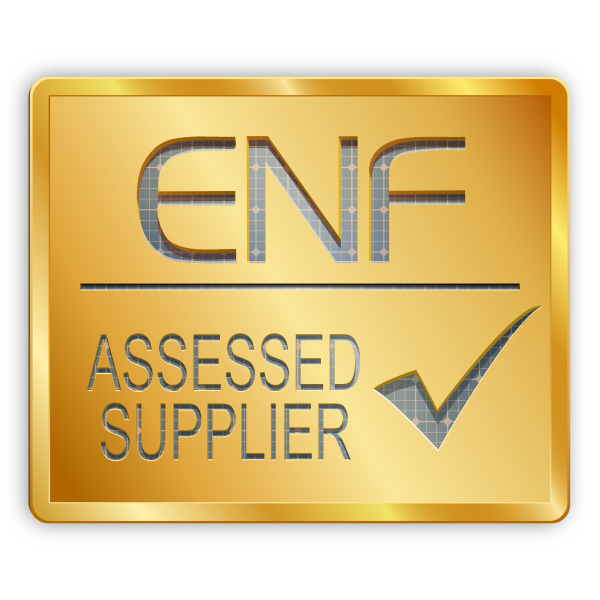 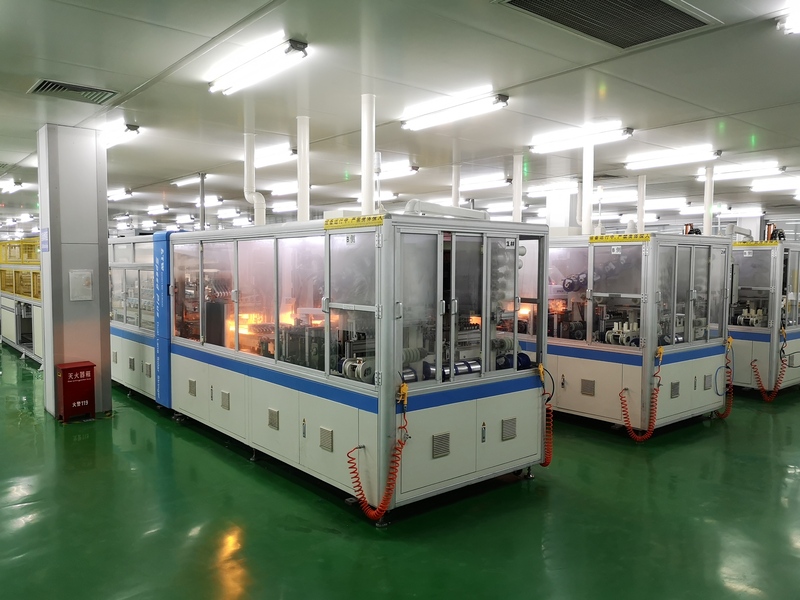 Established in Aug., 2005 by Shanshan Group who is one of the top 500 enterprises in China. 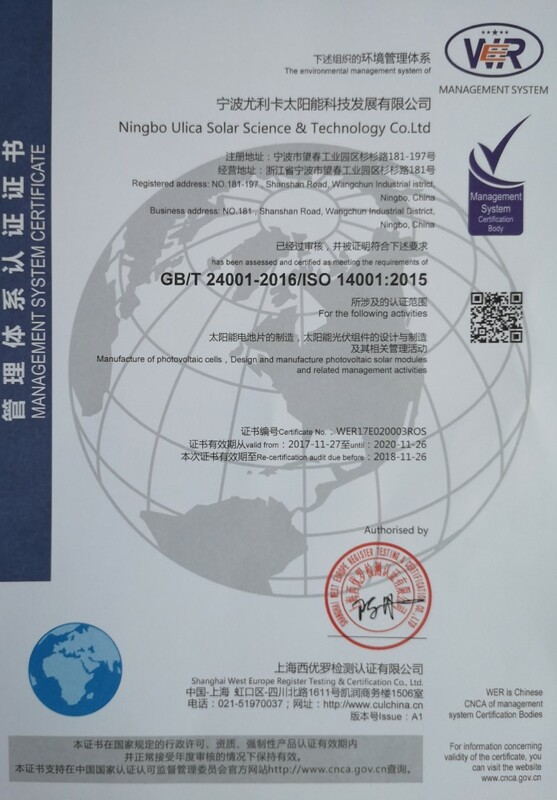 Ningbo Ulica Solar Science＆ Technology Co., Ltd. is a professional manufacturer specializing in producing solar cells, solar modules and providing solar system integration service in China. 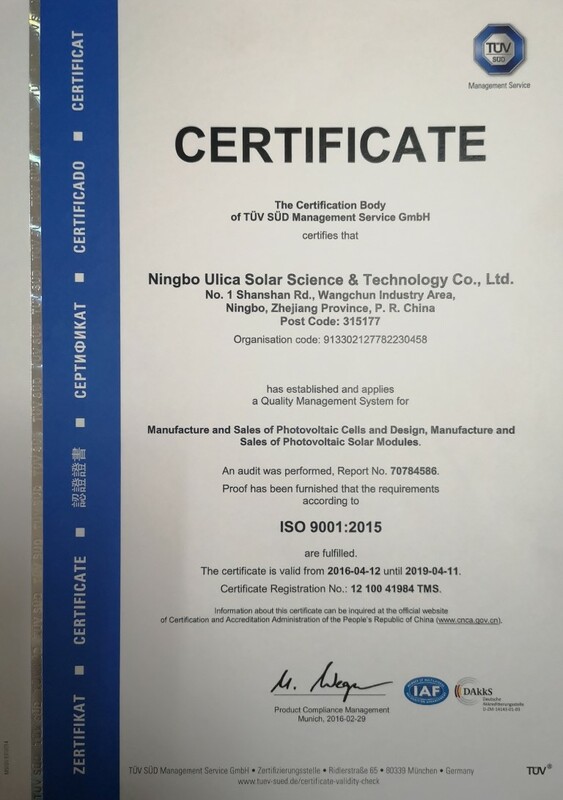 It boasts a vigorous and united team including senior technical experts, PhD and senior engineers in the field of solar energy.The location of Ulicasolar is in convenient transportation network. 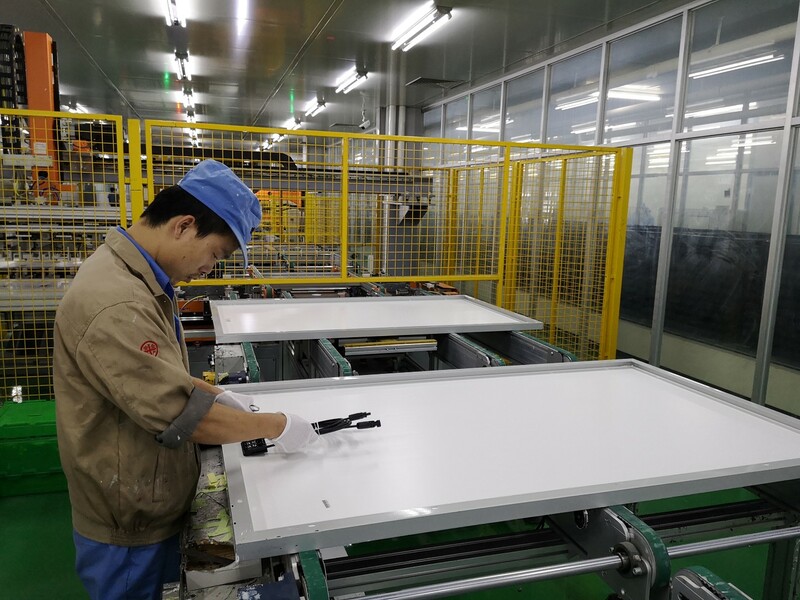 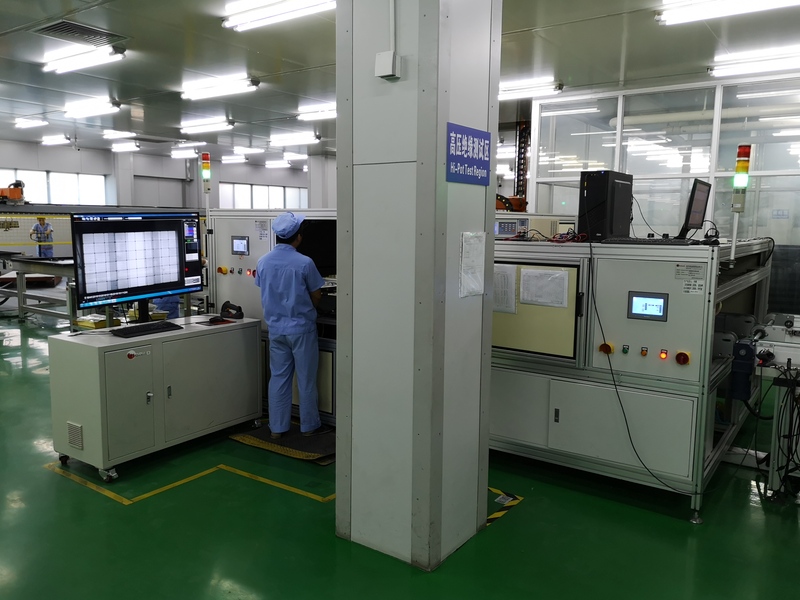 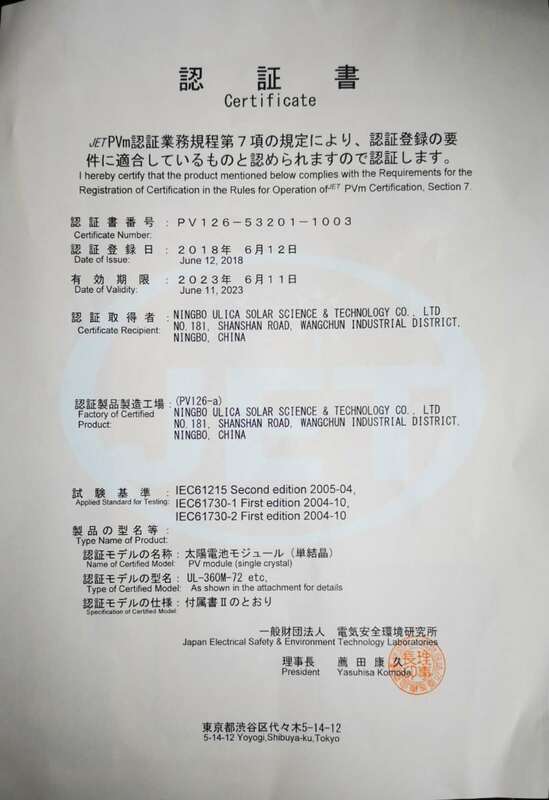 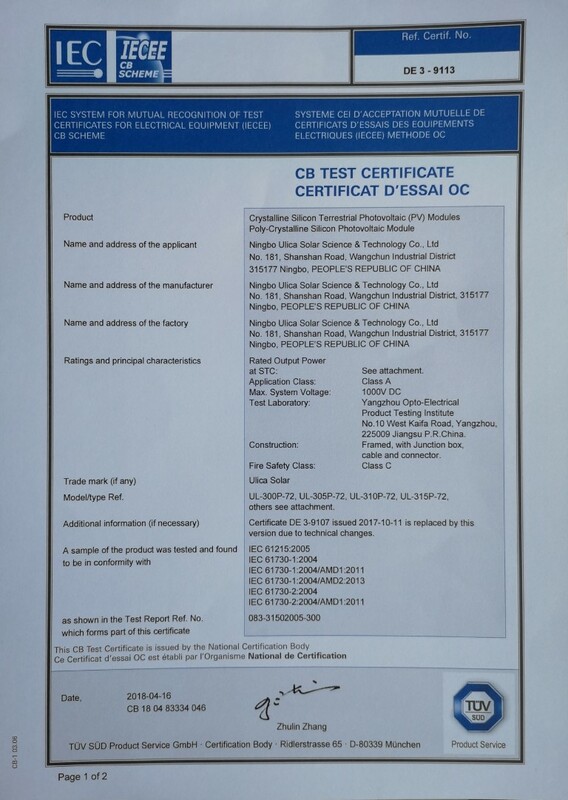 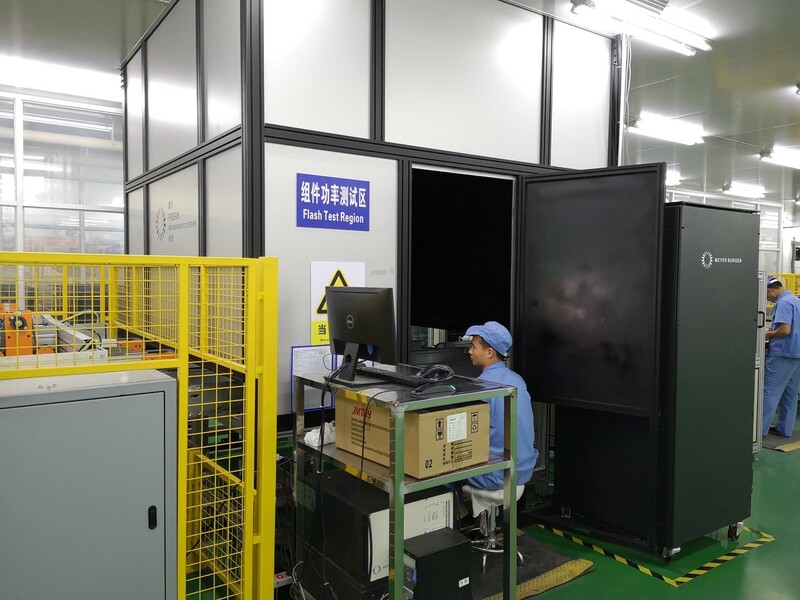 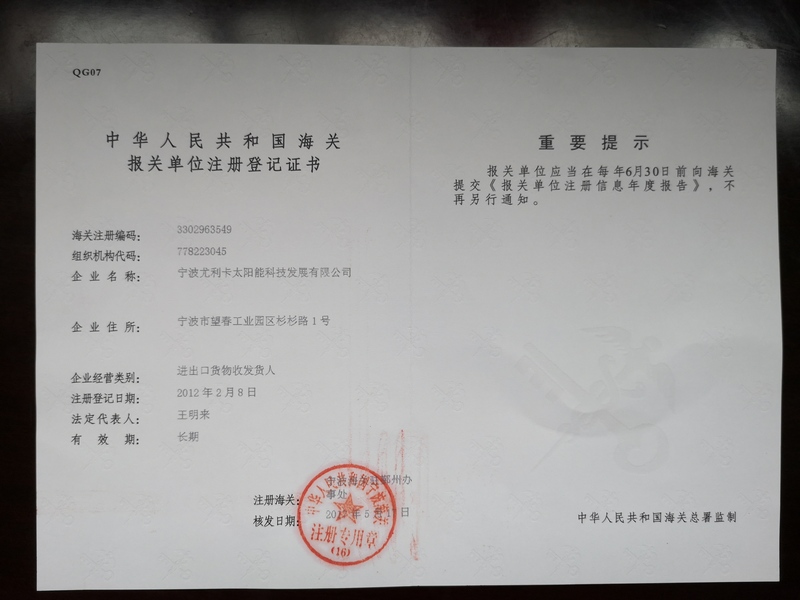 Since its establishment, UlicaSolar has been always devoted to the research and development on new technology, with 17 patents obtained, among which N-type mono-crystalline silicon solar cell is awarded as a National Torch Program. 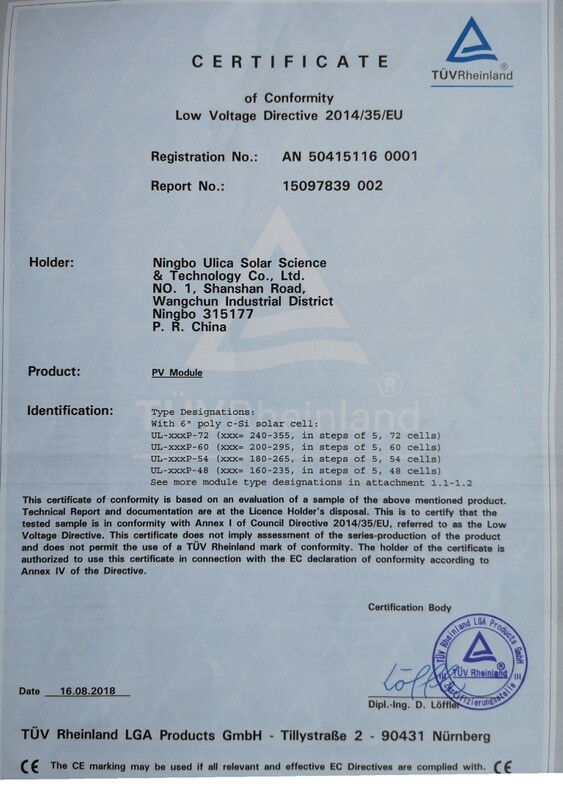 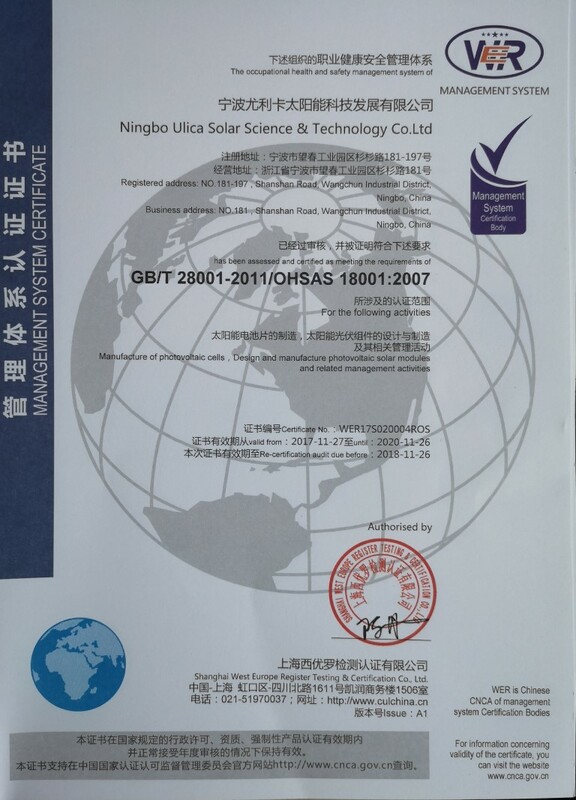 Ulica Solar has been also devoted to improving high efficiency and quality and reducing manufacturing costs.Currently as a National Hi-tech Enterprise and an engineering centre of Ningbo city, Ulica has acquired many international certificates, such as CE, IEC 61215 IEC 61730/T üV, UL, ISO9001, CEC and CGC-Solar and has access to the Chinese domestic market. 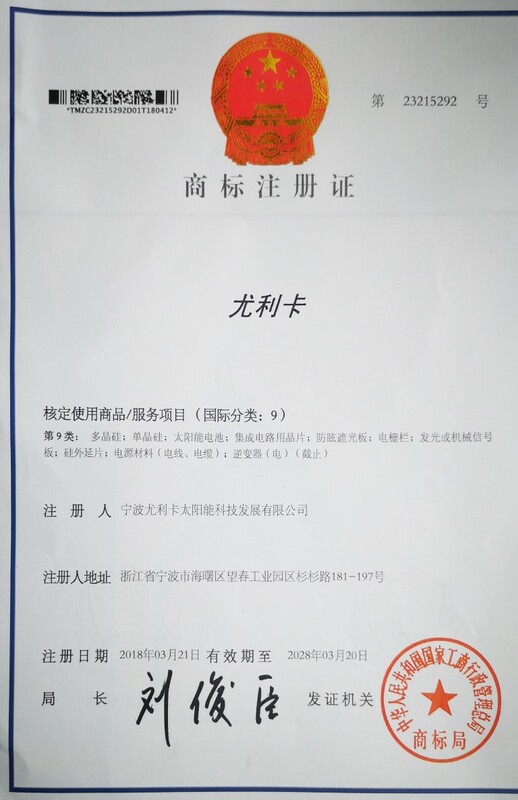 Ulica is also cooperating closely with some prestigious institutions and Universities including Ningbo Material Technology & Engineering Institution of Chinese Academy of Sciences, Shanghai Donghua University etc. 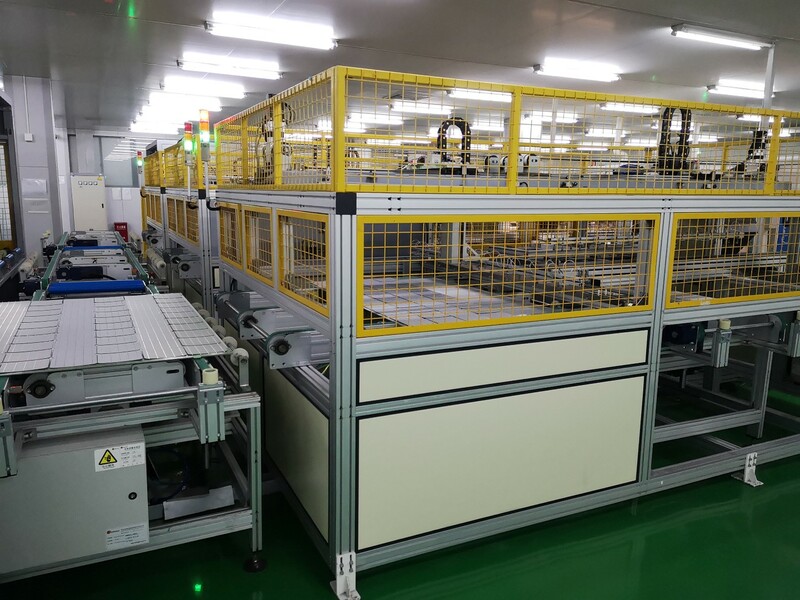 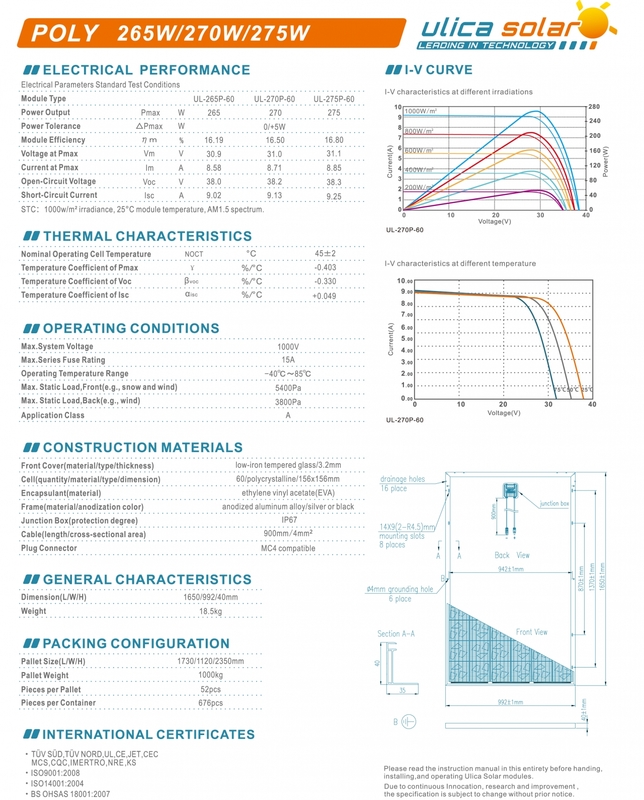 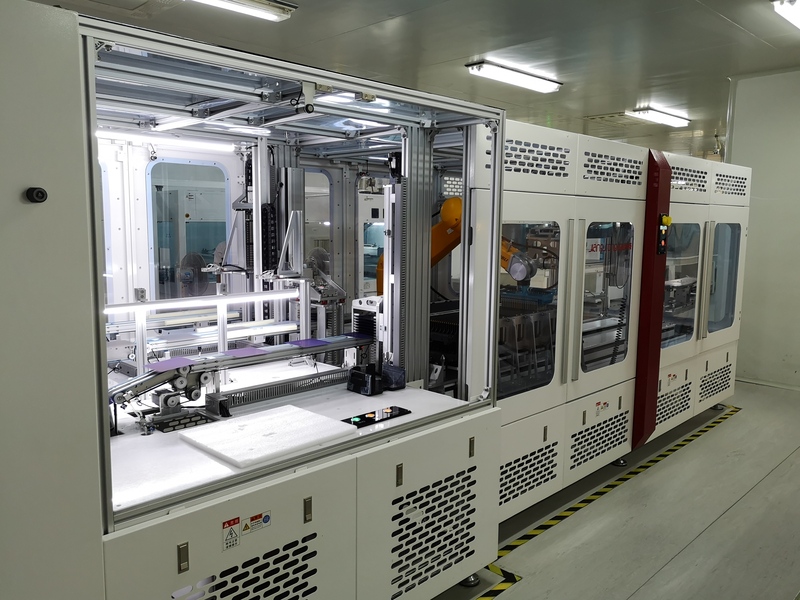 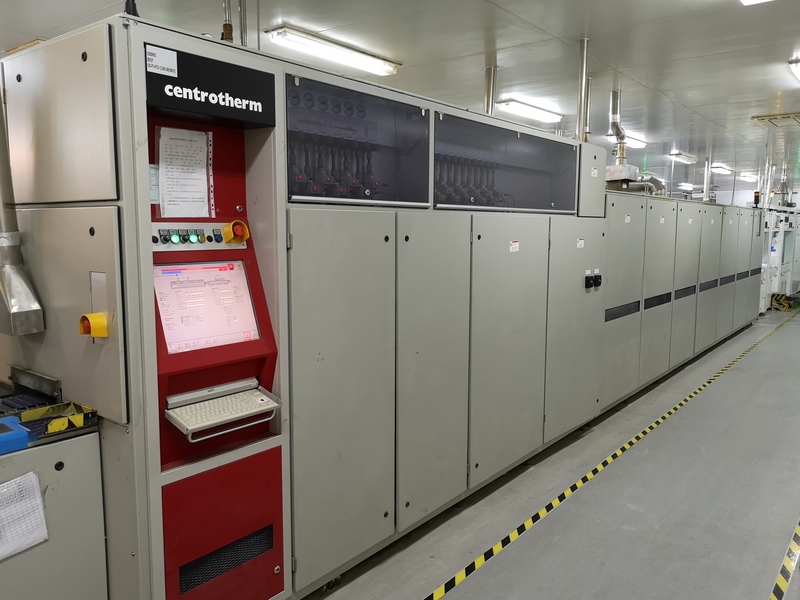 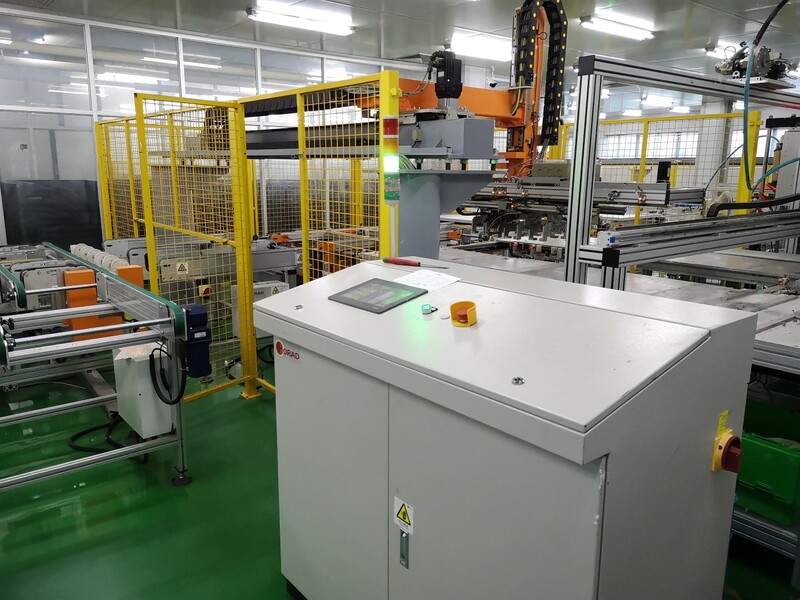 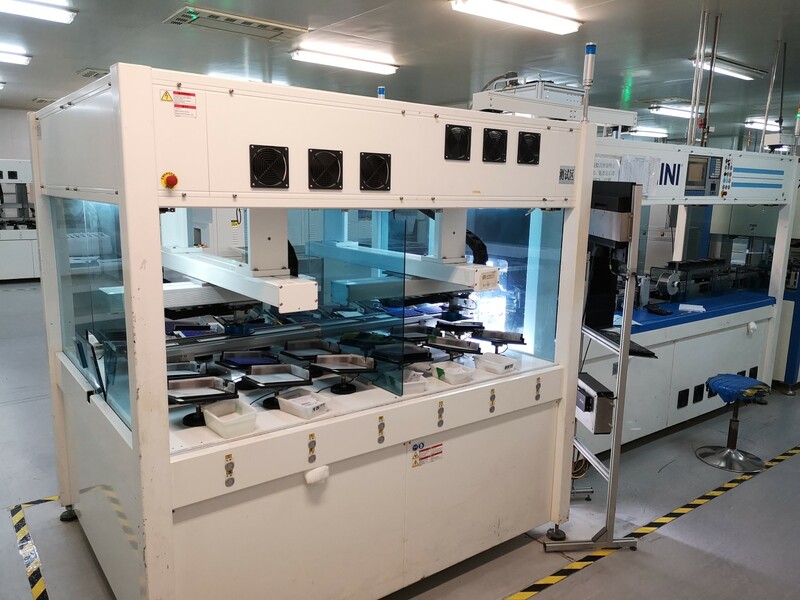 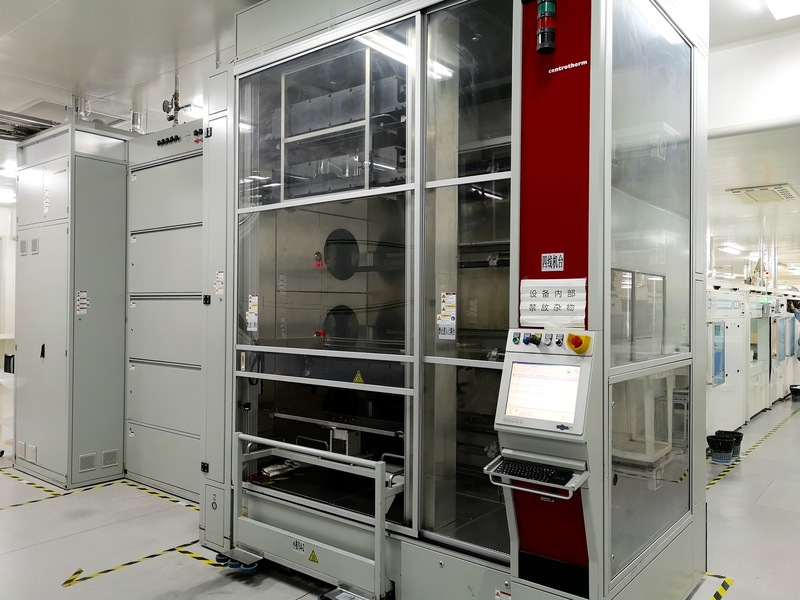 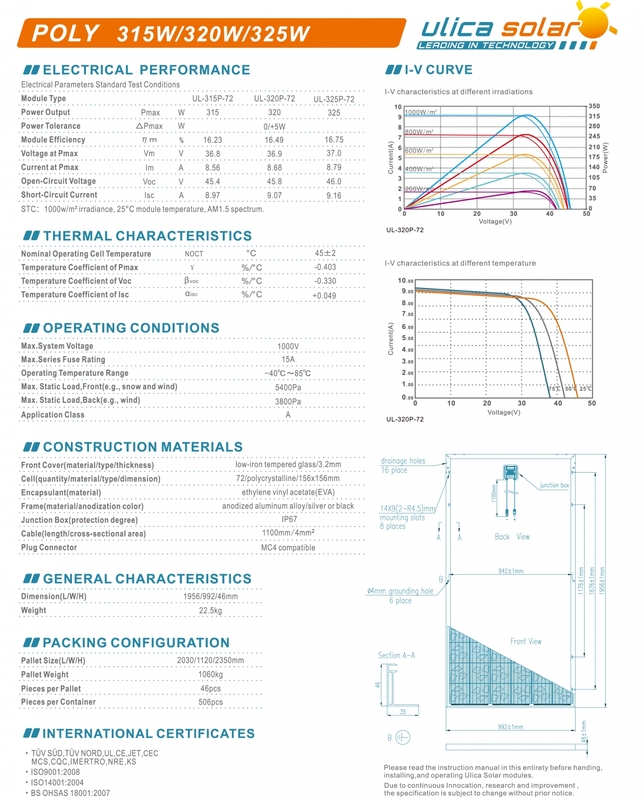 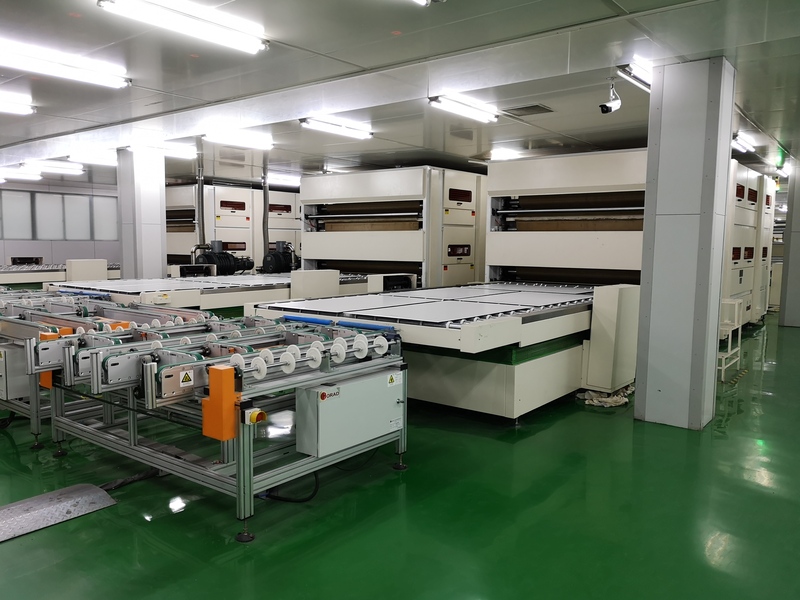 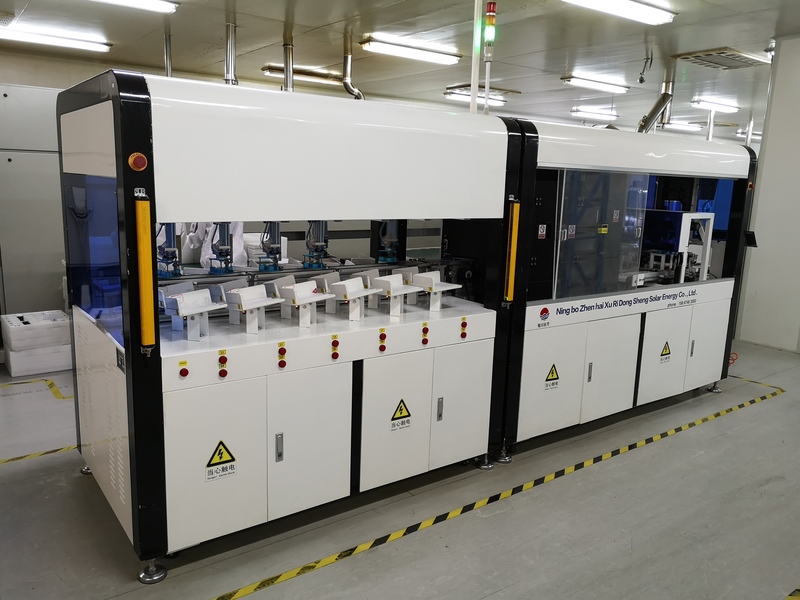 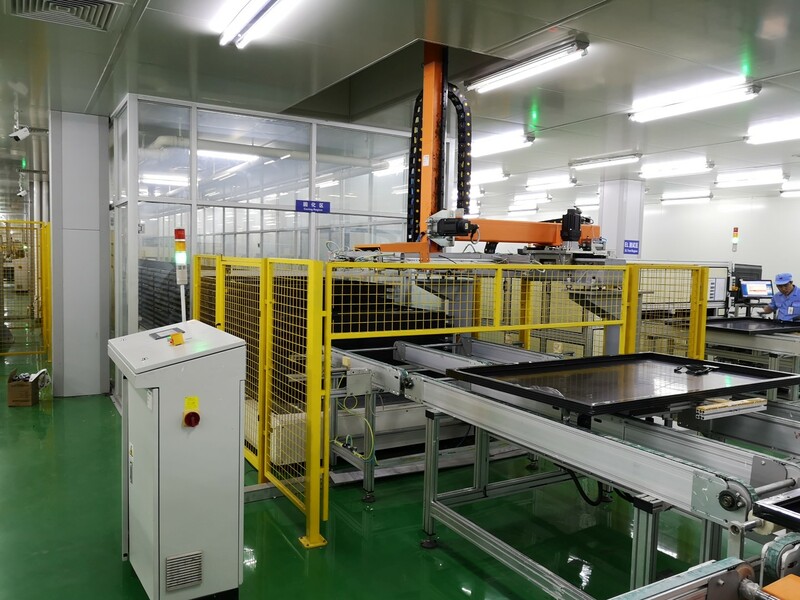 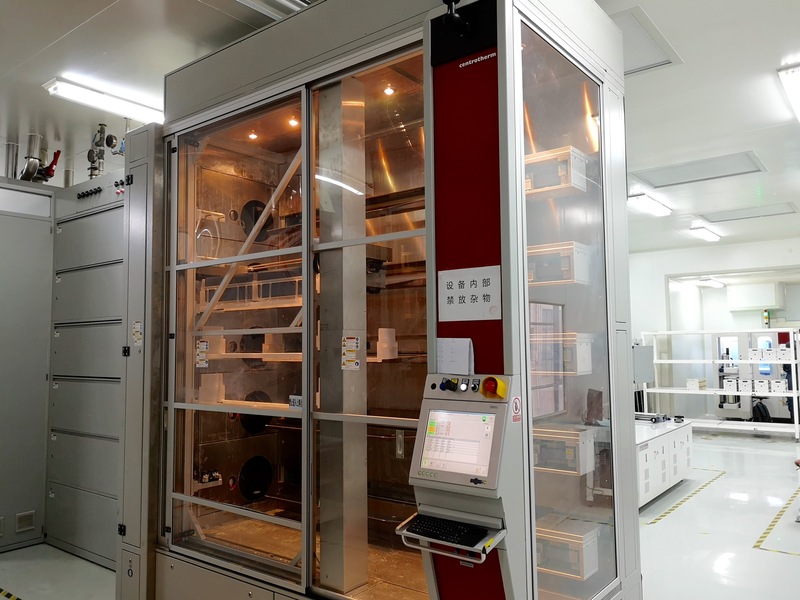 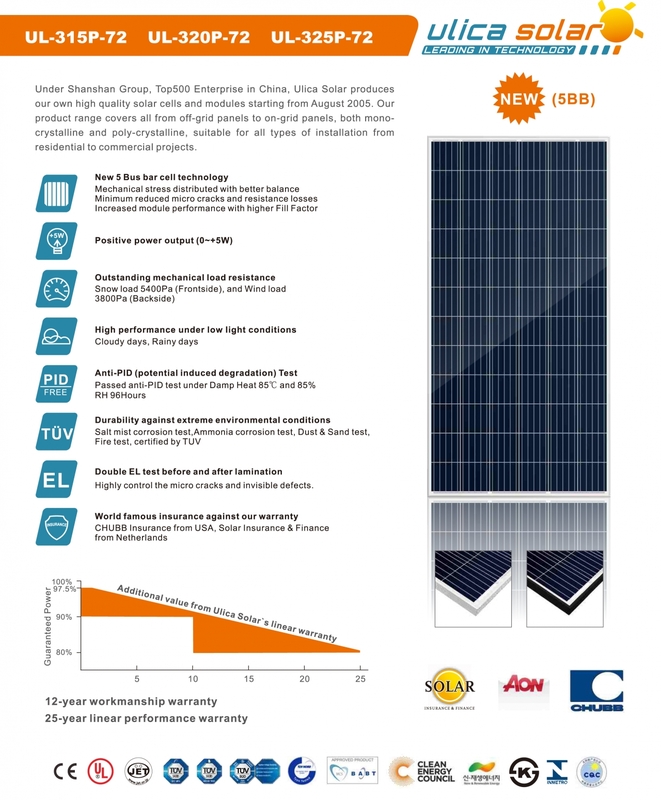 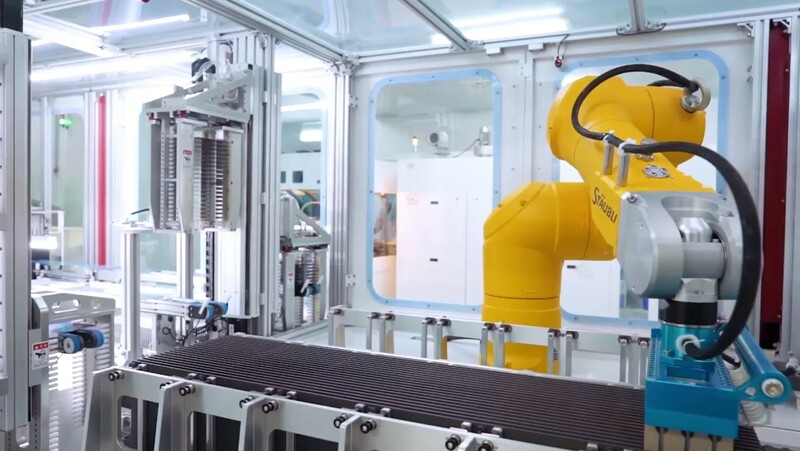 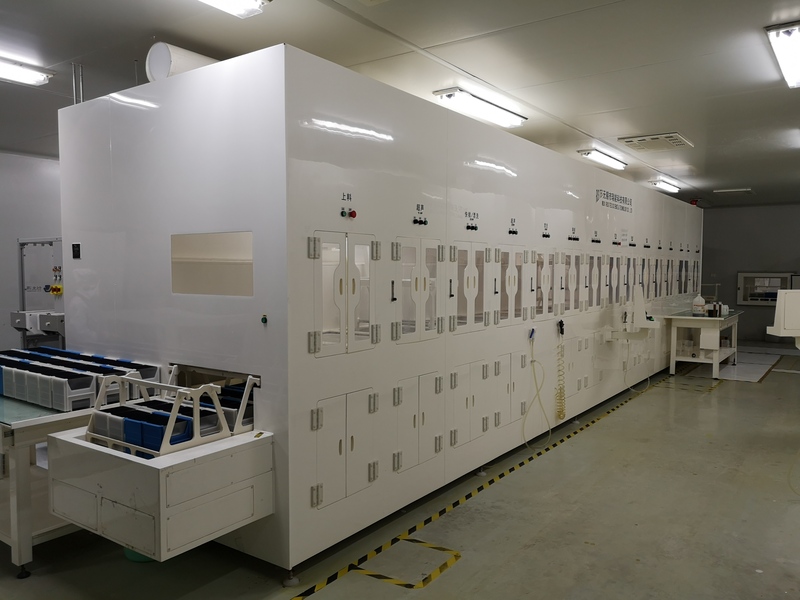 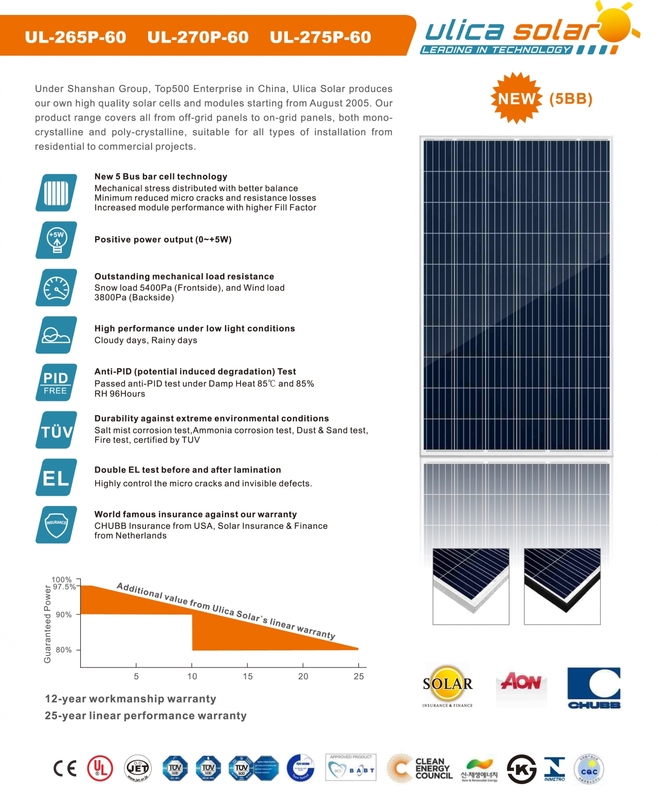 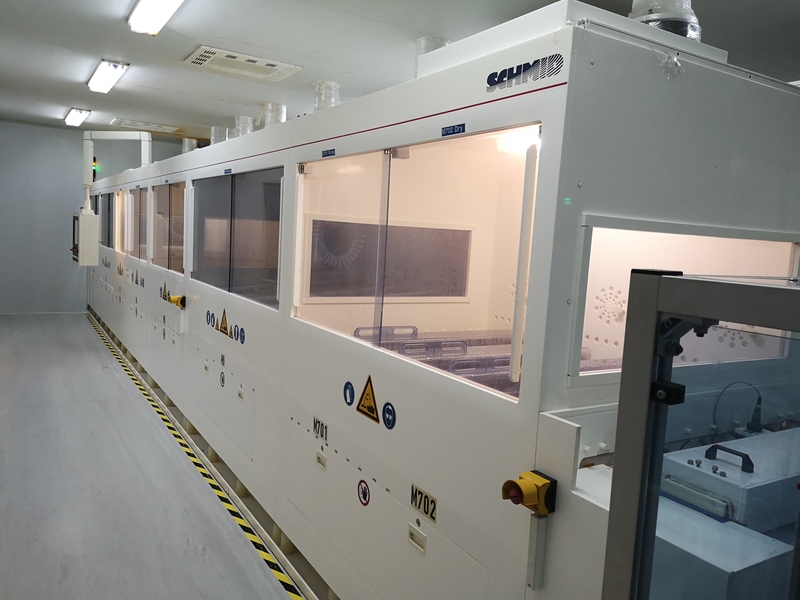 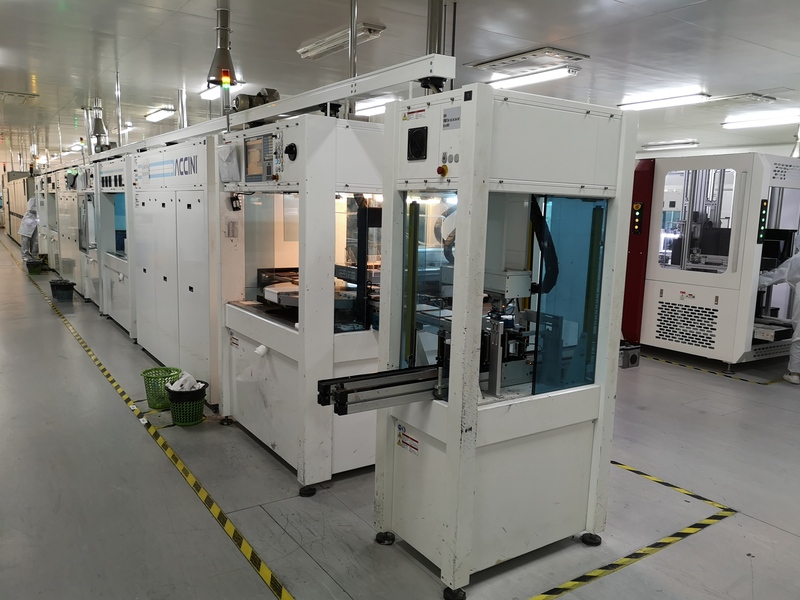 In order to enlarge production capacity and improve product quality, Ulica Solar has brought in the most advanced silicon solar cell manufacturing technology and state-of-art equipments from Germany, Italy, America, Japan and Spain, currently its annual production capacity is 450MW for cells and 450MW for modules respectively. 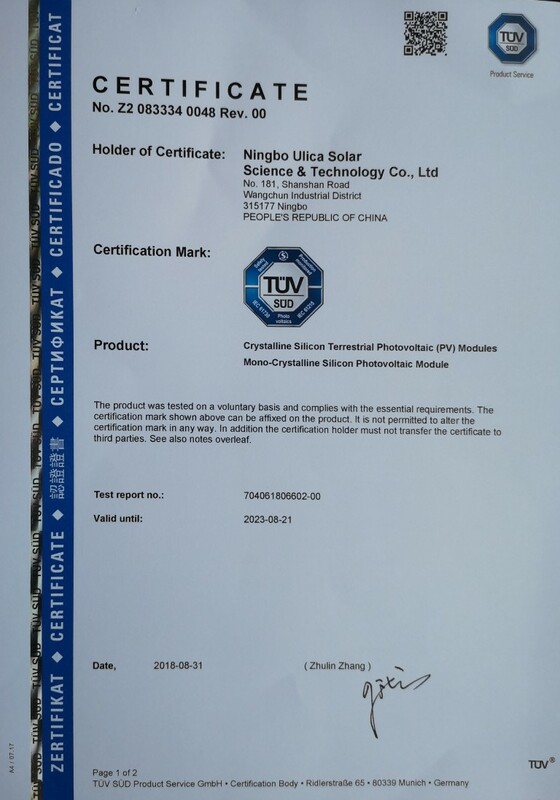 “Integrity, Innovation, Dedication, Responsibility” is the essence and core value of Ulica's enterprise culture, the inexhaustible source of Ulica's solidarity, and the most cherished spiritual treasure.Ulicasolar was, is and will always be devoted to protecting our planet, making more and more families enjoy renewable solar energy, to build a cleaner and more livable environment. 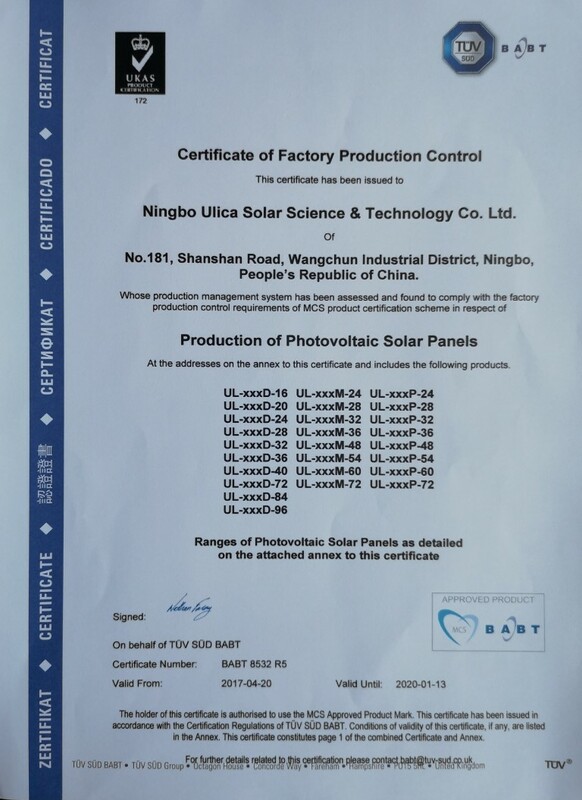 Ulica solar is also devoted to becoming a leading company in the field of solar energy, making contributions to the global environmental protection and energy saving.